A comprehensive financial plan has many aspects to it. Each of these categories can be a deep conversation, but our goal is to help you understand the right questions to ask and how to make decisions that will develop into an appropriate and personalized retirement plan. Our goal is to guide you through decisions so that you feel comfortable and confident about your future. 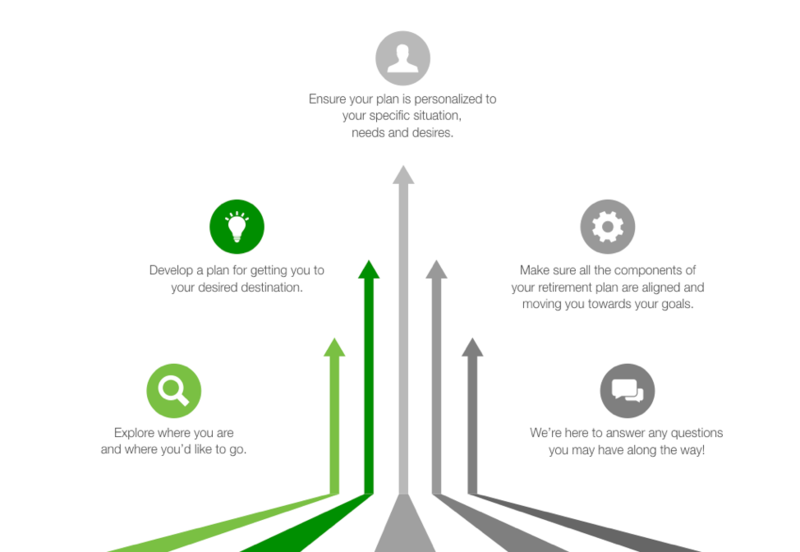 Our approach to retirement planning is personalized and thorough. We start with three important questions. Where are you now in terms of your retirement goals? We’ll conduct an analysis of your current financial position and talk extensively with you about your goals. We love learning about your retirement plans. We’ll help you develop a plan for helping you work toward where you want to be. Where are your investments allocated? Investment management is an important piece of retirement planning, but not the only piece. Protecting your downside is critical. What might the plan look like when you start to take distributions? Not all strategies will work the same for everyone. There are important decisions regarding Social Security that can have a dramatic impact on your retirement goals. Part of the retirement planning process is to make decisions that align with your overall goals. We’ll cover healthcare concerns and establish contingency plans for a surviving spouse in hopes of making this transition in an efficient and less stressful manner. A sound, clearly communicated estate plan is designed to help your loved ones make difficult transitions with confidence while aiming to protect their future quality of life. Our goal is to help you define the financial freedom you seek to pursue your interests so you can enjoy the retirement lifestyle you want.